With the end of RIT’s fiscal year quickly approaching on June 30, the Office of Development and Alumni Relations is encouraging alumni to propel annual giving over the top—with the help of RIT’s board chairman. Rally for RIT—taking place June 1–12—is a challenge to alumni to make 1,829 gifts to RIT in 12 days to commemorate RIT’s founding on June 12, 1829. Brian Hall ’78, chairman of RIT’s Board of Trustees, has committed a $40,000 gift to RIT because, according to Hall, he is “confident we will reach this goal.” Although Rally for RIT is geared toward alumni giving, faculty and staff are encouraged to help spread the word. Gifts can be made online at rit.edu/rally or by calling 800-477-0376. 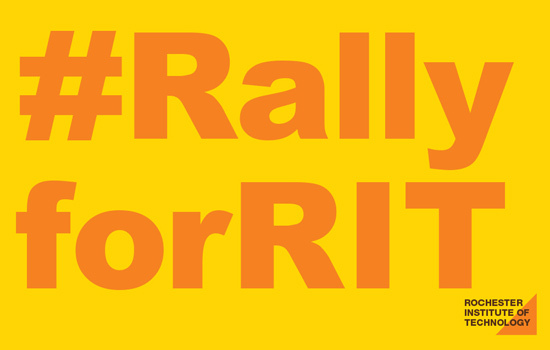 Coordinators also encourage alumni to let classmates and friends know they helped Rally for RIT by using the #RallyforRIT hashtag on Twitter, Facebook and Instagram. Challenge updates are available online.